Meera Enterprises, Inc., distributor of world-famous brands like Oakley and Reef, has gone live with SAP Business One through a partnership with Fasttrack Solutions in its bud to streamline its processes and become more competitive in the premium-brand apparel industry. SAP Business one is an enterprise resource planning (ERP) solution software for small to medium-sized business. 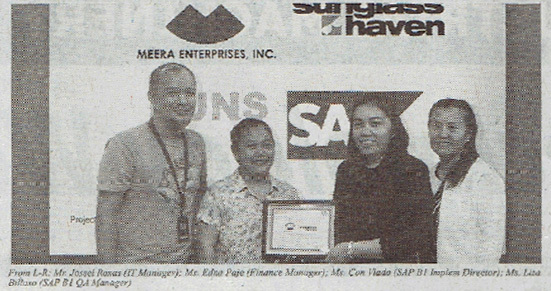 Meera’s acquisition of SAP Business One, which went live in March 2016, automates the company’s processes and provides meaningful data from an integrated system at the right time. “We now have confidence in the data at hand,” says Mr. Jossel Roxas, IT Manager of Meera. “At anytime we need information on which to base our decisions, SAP B1 provides us on-demand standard report,” he added. The features of SAP B1 correct the challenges previously encountered, namely the generation of inconsistent and incomparable data, non-standardized report and manual finance and accounting systems. Meera distributes designer eyewear, footwear, apparel and accessories and positions itself as a provider, an investment, and an employer of choice. Fasttrack Solutions, Inc. is a leading SAP partner in the Asia-Pacific region. SAP, founded in Germany but with the vast global presence, has more than 40 years’ experience in providing business solutions to companies of all sizes across various industries.